The party is proposing a radical overhaul of the tax system and the introduction of a single 23% rate. RENUA HAS BLAMED “technical issues” for the removal of a flat tax calculator from its website yesterday. The tax calculator was launched to coincide with the party’s symposium on its radical proposal to abolish the current income tax regime, USC, and PRSI and replace them with a single flat rate of 23%. Everybody, irrespective of income, would pay this rate with tax rebates to low income households on a sliding scale to avoid any drastic fall in their take home pay. The proposal has been criticised by other parties as disproportionately impacting people on low incomes. But Renua has insisted that tax rebates would make up for any loss of income. 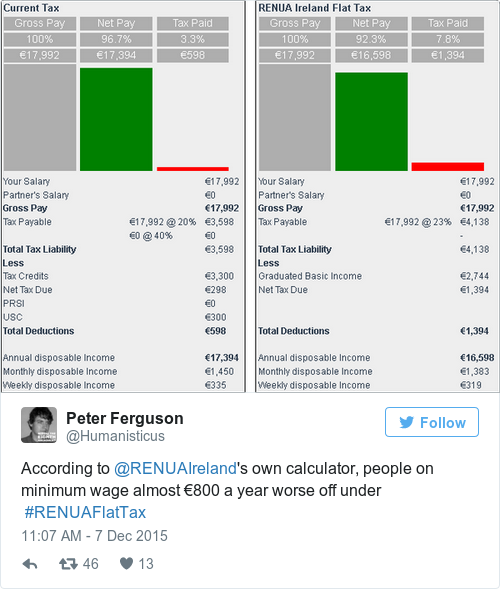 @RENUAIreland According to your tax calculator I'd pay €811 more with a Renua Govt. Given big increase what services can I expect in return? This morning, Labour TD Anne Ferris questioned why the calculator had been removed asking if Renua was “embarrassed” by a “regressive policy that would benefit the highest income earners in society most and put high taxes on minimum wage workers”. Their own income tax calculator yesterday showed that someone working on the minimum wage will actually end up paying more per year in income tax under their flat tax proposal, while a high income earner will pay less in income tax per year. It seems a bit strange that Renua has removed its flat tax calculator from its website. Perhaps it wasn’t eliciting the responses the party expected. She said the Renua’s flat tax proposal would “substantially increase taxation on those on lower incomes, therefore substantially reducing incentives to work”. But a spokesperson for Renua insisted that “technical issues” were to blame for the calculator’s removal without expanding further. Asked when the calculator would be reinstated, they said it it would be when these issues are resolved. Email “Renua says flat tax calculator taken down over 'technical issues' - but others aren't so sure ”. Feedback on “Renua says flat tax calculator taken down over 'technical issues' - but others aren't so sure ”.